There is a Japanese saying that says there are three remedies for sadness – a family gathering, genial exchanges and delicious food. Why not combine all three and create a most potent salve to cure all your cares? 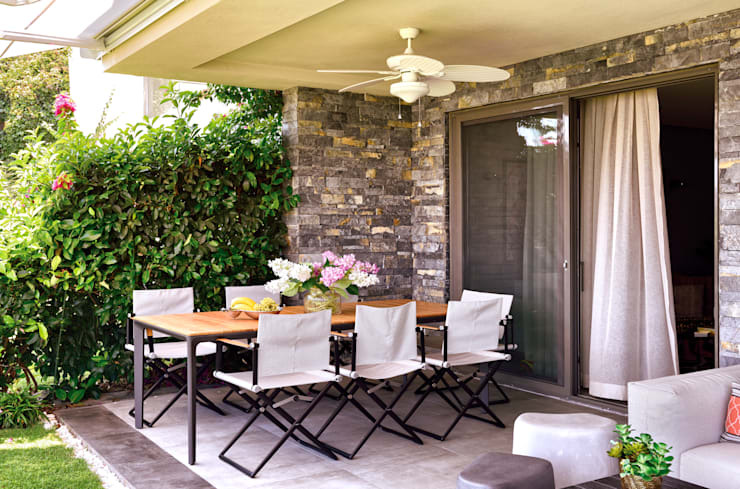 Design a delightful outdoor dining area and invite your close friends and family members. Share a hearty meal with them in a genial setting and enjoy a most wonderful time. To make your job easy, we are sharing with you six outdoor dining areas designed in an extremely small space. 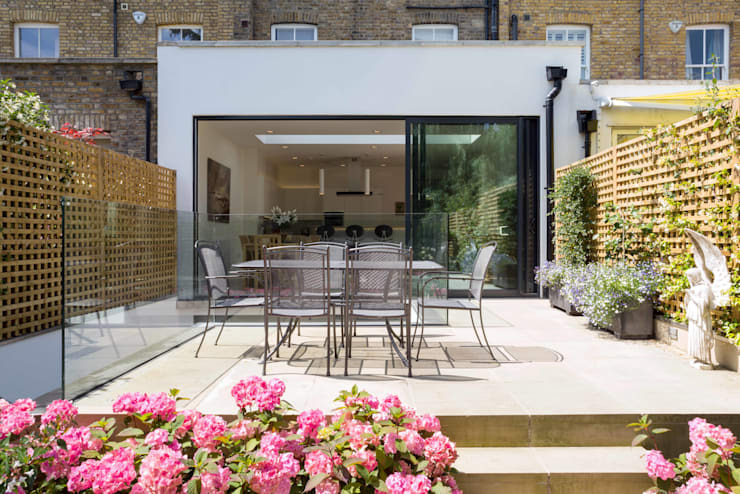 The rear garden of this urban family residence boasts of an inspiring design. It is stylised with rustic wooden table and a set of foldaway chair. A tiny patch of green lawn is further decorated with flower plants and vines. The space is enclosed in wooden boundary walls resembling a trellis. What more do you need to design a delectable outdoor dining area in your premises? Now you may enjoy the dining out with your friends almost every other day without stepping outside your home. All you need to do is to buy a set of outdoor furniture that looks perfectly in tune with the exterior environment. 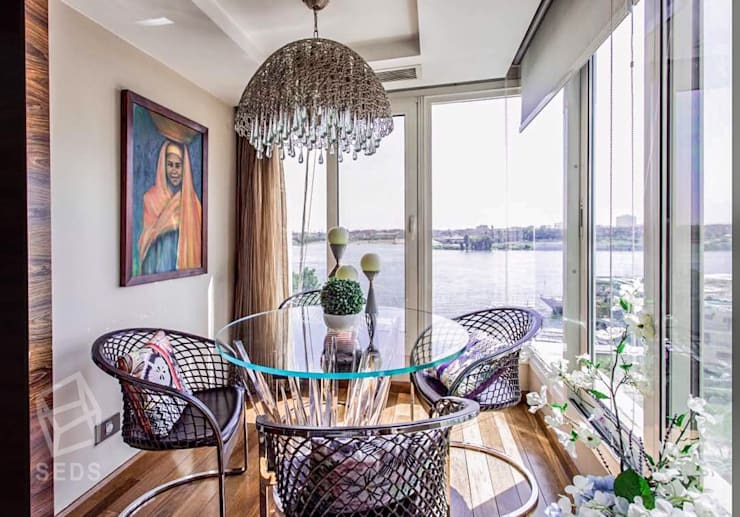 The interior designer of this home designed a fun loving space for the owners of the house. The small confinement of this dining area is decorated with lightweight and ravishing red chairs, a wooden table and great many plants and cacti. 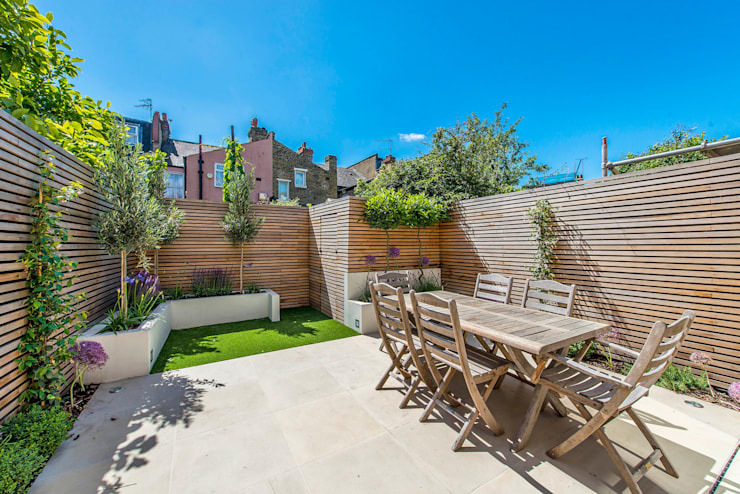 Learn these simple tricks to decorate a garden within a tight budget. So you only have a small balcony in your apartment. But you still can convert this into a shaded dining area with a chic décor. All you need to do is use furniture that is suitable for a small space. Decorate the space with potted plants and elegant lighting fixtures. And, when possible, make best use of the views of the surroundings. You may take inspirations from the charming design of this small dining space on the image above. The sunlit dining area of this small urban dwelling looks a perfect place to relax with family members. It is decorated with simple outdoor furniture and lots of green plants. Trellises are built on either side of the dining area to provide it with some amount of privacy. It is connected with the interior dining room and kitchen which is separated from this space with sliding doors. Don’t worry if you don’t have a sprawling area to decorate a lavish entertainment area on your backyard. Make optimal use of the little space available on your patio or balcony. Place foldaway canvas chairs like the ones in the image above and a dining table with a simple chair. Don’t forget to decorate the space with plants and flowers. In the evening light candles or lanterns to induce a warm feeling in the atmosphere. In a space like this you have the advantage of offering your guests an excellent view of the surrounding. But that is not its only plus point. Courtesy the smart design solutions of the architect, the small dining space of this house boasts of comfort and elegance. From the flooring to the boundary walls, every part of the terrace has been designed meticulously. The vine creates a shade above the dining area and enhances the beauty of the space. 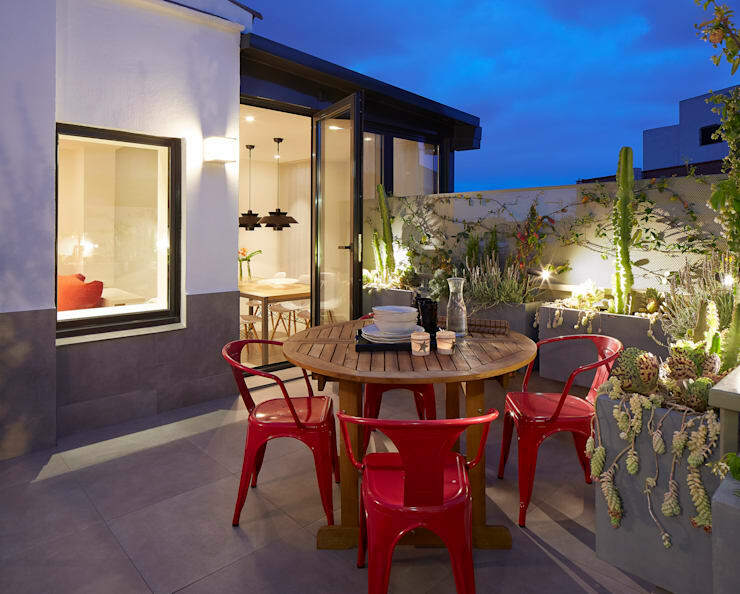 Check out these inspiring ideas for decorating a relaxing terrace. 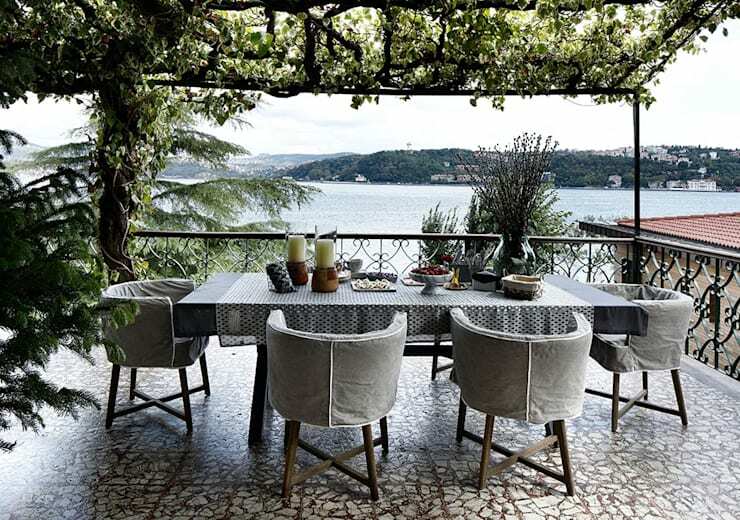 Which of these outdoor dining areas did you find most attractive?